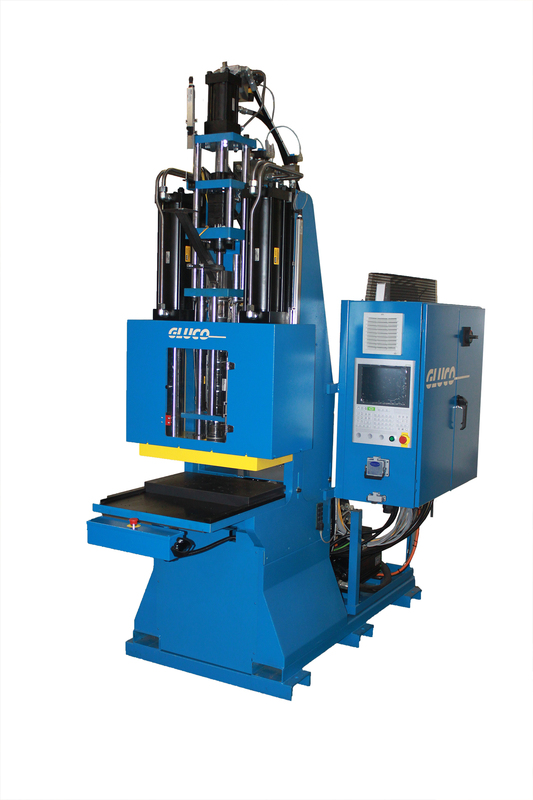 Gluco new vertical machine design was created around the high technical requirements for vehicle sealing systems suppliers. Ideal for corner molding or glass encapsulation applications. Complete new design for top to bottom with future material advances in mind. New C-frame design with obstruction free molding on all three sides of mold area ,clamp tonnages from 40 to 250 ton, extended 18” clamp stroke to accept all mold heights, wider platens with larger space behind mold area for mold core cylinders, multiple choices of injection unit sizes with custom screw designs. KEBA KePlast servo hydraulic package with separate closed loop injection control. KEBA latest PLC and HMI design with advanced programing. All presses are available with stationery table, front to back or left to right shuttle table or rotary table. Gluco new VSS series is also available for EPDM or Sponge rubber molding. Features include custom screw and spiral barrel design for stable material temperatures, nozzle shutoff plate for charging barrel off the mold for faster cycle times. Machines are offered with or without shuttle tables. For high production applications we offer multi-station rotary table injection molding machines. 4-12 station rotaries have heated platens for every station with outboard clamping cylinders to hold mold close while table is rotating. You will be saving valuable time by curing the part in one station while the injection station is molding the next part. One station prior to clamp is a finished part presented in as little as every 10 seconds.